shifts are used in the present calculations. 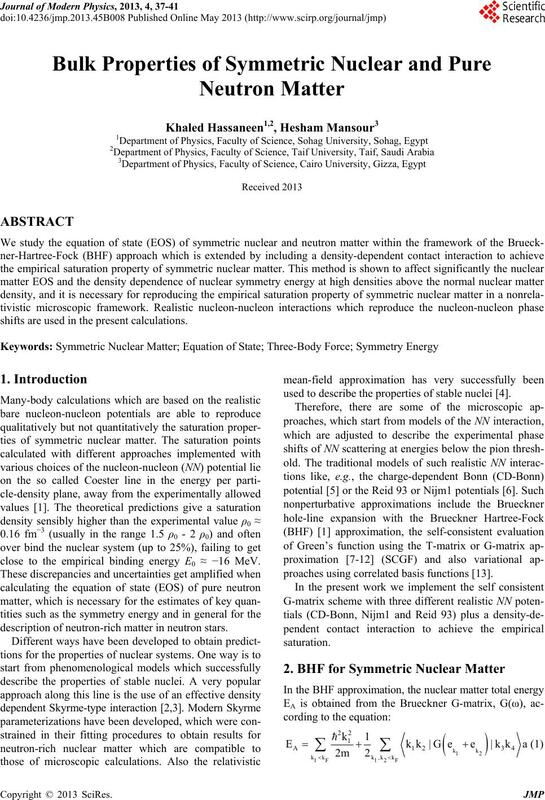 close to the empirical binding energy E0 ≈ −16 MeV. description of neutron-rich matter in neutron stars. used to describe the properties of stable nuclei . proaches using correlated basis functions . and is zero otherwise and ω denotes the starting energy. parameters are listed in Table 1. ≈ 0.17 fm-3 ; E/A ≈ -16 MeV, close to the empirical one. give similar EOS up to moderate values of the density. points of the experimental data of the symmetry energy. isfactory fit for the neutron matter data. constrained to reproduce this region. tinuous choice in comparison with differe nt appr oac hes. Fermi momentum kF are depicted in Figure 3.
using different potentials for the continuous choice. here. Two terms are used only in our suggested potential. a fit with the inclusion of neutron matter properties. Physical Review C, Vol. 5, No. 3, 1972, pp. 626-647. 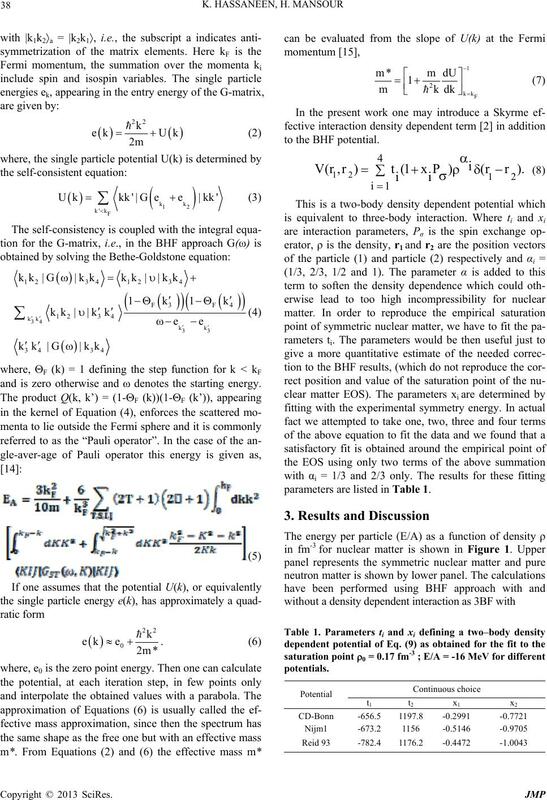 Nuclear Physics, Vol. 58, No. 2, 2007, pp. 587-657.
ports, Vol. 409, No. 3-4, 2005, pp. 101-259. 2001, pp. 024001 (32 pages). V. G. J. Stoks, R. A. M. Klomp, C. P. F. Terheggen and J. Physical Review C, Vol. 49, 1994, pp. 2950-2962. 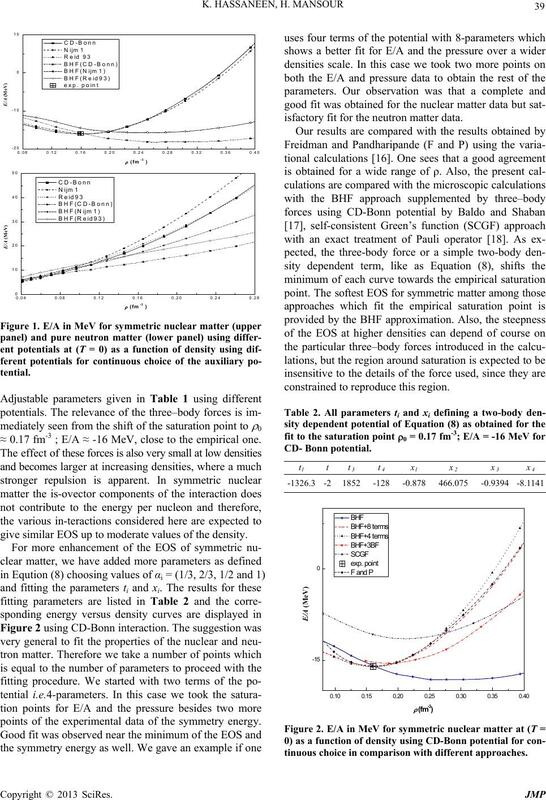 Short-Range Correlations,” Physical Review Letters, Vol. 90, 2003, pp. 152501(4 pages). Vol. 65, 2002, pp. 034321(13 pages). Physical Review C, Vol. 70, 2004, pp. 054308 (5pages). view C, Vol. 56, 1997, pp. 2261-2279. Physics A, Vol. 158, No. 1, 1970, pp. 1-42. 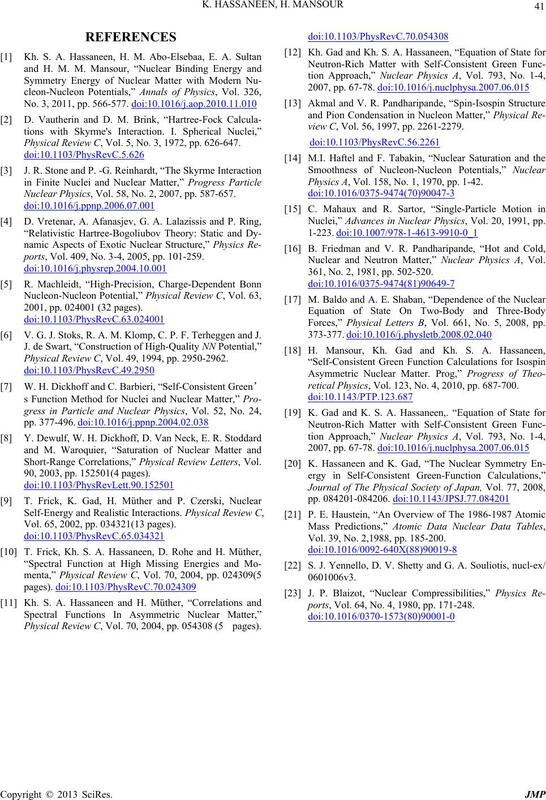 Nuclei,” Advances in Nuclear Physics, Vol. 20, 1991, pp. 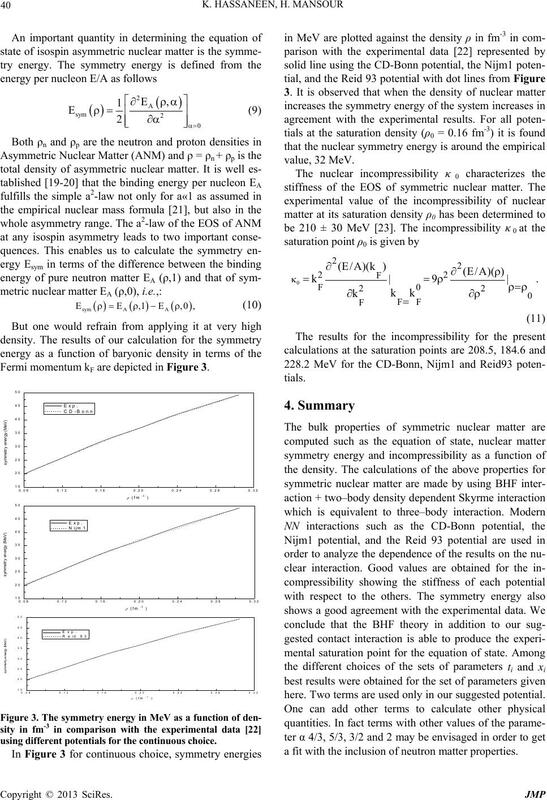 Nuclear and Neutron Matter,” Nuclear Physics A, Vol. 361, No. 2, 1981, pp. 502-520. Forces,” Physical Letters B, Vol. 661, No. 5, 2008, pp. retical Physics, Vol. 123, No. 4, 2010, pp. 687-700. Vol. 39, No. 2,1988, pp. 185-200.
ports, Vol. 64, No. 4, 1980, pp. 171-248.